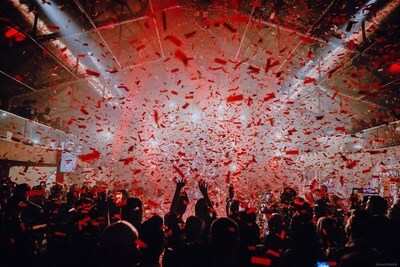 MONTREAL, April 17, 2019 /CNW Telbec/ - Over 1,200 guests rang in spring's return last Friday by taking over New City Gas for the 13th edition of the famous Printemps du MAC benefit gala. 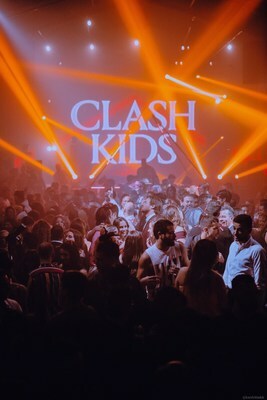 Attendees embraced this year's theme, CLASH KIDS, as they dove into the Berlin underground's edgy and offbeat punk rock atmosphere. This event, which aims to spread awareness about contemporary art among the younger generations and the Musée d'art contemporain's (MAC) importance in preserving and showcasing this heritage across Quebec, Canada and beyond, directly contributes to the Musée's growth, as all proceeds are donated to the Fondation du MAC. 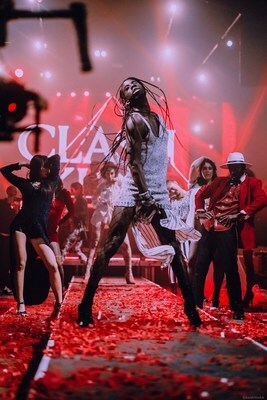 Renowned for its festive atmosphere, trendy and cutting-edge attendees, and celebration of the freedom of expression and inclusive vibe toward all genres and styles, the Printemps du MAC once again showcased its guests' spectacular looks. Developed by Maison W and guided by event artistic director and organizing committee member Jean-François Gervais of MOOG Audio, the evening's theme, CLASH KIDS, inspired guests to put on extravagant makeup, sequins, fluorescent colours, tutus, along with other bolder and more eccentric outfits. Attendees grooved to the sounds of DJs Frigid, Maddie Longlegz and M.Bootyspoon, lived a unique experience surrounded by an impressive decor, and bid on various lots during one of the biggest auctions in the history of the Printemps du MAC. Ten artists–both up-and-coming and more established, with pieces in private, corporate and museum collections– generously donated a piece for the cause. Attendees discovered the works of Zoé Boivin, Dan Brault, Qarim Brown, David & Jorden Doody, Nicolas Grenier, Trevor Kiernander, Josiane Lanthier, Philippe Pallotta, Celia Perrin Sidarous and Jerry Pigeon. Created in 2006, the event dazzles every year under the guidance of the Printemps du MAC Organizing Committee, a group of young philanthropists passionate about contemporary art, whose mission is to plan a unique event with genuine added value for guests as well as provide the MAC with exposure benefitting the Fondation du Musée d'art contemporain. Shady Ahmad (Budge Studios), Virginie Bourgeois (MBA 2019 candidate), Ariane Bisaillon (Blakes), Erika Del Vecchio (Pierre-François Ouellette Art Contemporain), Francis Guindon (Quartz Co.), Lysandre Laferrière (Saputo), Jean-François Gervais (MOOG Audio), Marion-Isabelle Muszynski (Banque Nationale), and Catherine Plourde (Mouvement Desjardins). The Fondation du Musée d'art contemporain de Montréal extends its warmest thanks to its major partners in Les Printemps du MAC and, in particular, National Bank, main sponsor of the Foundation's events, and Power Corporation of Canada. The Fondation du MAC is dedicated to supporting the museum in its various activities, with a focus on building the collection, mounting exhibitions and maintaining educational programs. To achieve this mission, the Foundation's mandate is to raise funds from organizations and individuals interested in promoting and preserving contemporary art from Québec, Canada and abroad. In this way, the Foundation helps raise the profile of the collection at the heart of Canada's premier institution devoted exclusively to contemporary art. Located in the heart of the Quartier des Spectacles, the Musée d'art contemporain de Montréal makes today's art a vital part of Montréal and Québec life. For more than fifty years, this vibrant museum has brought together local and international artists, their works and an ever-growing public. It is a place of discovery, offering visitors experiences that are continually changing and new, and often unexpected and stirring. The Musée presents temporary exhibitions devoted to outstanding and relevant current artists who provide their own, particular insight into our society, as well as exhibitions of works drawn from the museum's extensive collection. Every form of expression may be featured: digital and sound works, installations, paintings, sculptures, ephemeral pieces, and more. In addition to its wide range of educational activities familiarizing the general public with contemporary art, the Musée also organizes unique artistic performances and festive events. It is a window onto a myriad of avant-garde expressions that increase the exposure and awareness of art throughout the city and beyond.